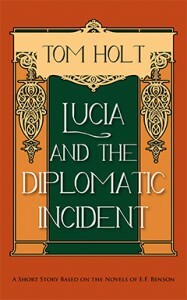 The short story, “Lucia and the Diplomatic Incident,” by British novelist Tom Holt, is a fresh new adventure in the Lucia and Mapp series based on the novels of E.F. Benson. It is currently only available as a Kindle Single, priced at $.99. Until now it has appeared in print only once, in the Benson Society Magazine in 1997. Tom Holt’s two full-length novels in the Lucia and Mapp series are already available from Coffeetown Press. They are the only officially sanctioned sequels featuring E.F. Benson’s delightful social-climbing characters. Lucia in Wartime ($13.95/£9.99, 216 pages, ISBN: 978-1-60381-129-3) and Lucia Triumphant ($14.95/£10.99, 262 pages, ISBN: 978-1-60381-126-2), were first published in 1985 and 1986, respectively. The cover images are by one of the original cover illustrators, Marie Michal. Tom Holt was born in 1961 in London, England. His first book, Poems By Tom Holt, was published when he was twelve years old. While he was still a student at Oxford he wrote two sequels to E.F. Benson’s Lucia series. After an undistinguished seven-year stint as a lawyer, he became a full-time writer in 1995 and has published over thirty novels. Tom lives with his wife and daughter in the west of England. As well as writing, he raises pigs and pedigree Dexter cattle. For more information, go to tomholt.coffeetownpress.com.